Located on Washington Street features Stoyer's Dam, a performance stage, and three pavilions equipped with electricity. It also has several charcoal grills, a gazebo, war memorial, small playground, and handicap accessible bathrooms. Plenty of benches, trees, and swans adorn the landscaped grounds. It's the perfect scenic view to host outdoor gatherings and field trips. If you enjoy walking, jogging, fishing or just want to have a picnic with your family, friends or someone special, Bubeck Park is most inviting and a beautiful place to relax. Reservations are being taken for all three pavilions for parties, meetings or family outings. To reserve a pavilion call 385-1313. Your rental will not be booked until you call and reserve a time. The Recreation Department provides the Schuylkill Haven Area community with family-friendly parks, playgrounds, amenities, programs and events. If you would like to support this effort, the Recreation Department has many donation opportunities! These opportunities range from sponsoring a new tree or bench for at a park, to becoming an advertiser whose sign hangs on a baseball field at Island Park or volunteering your time for a program. To find out how you can help, contact us at (570) 385-1313. Below are two ways to help make the parks more beautiful! 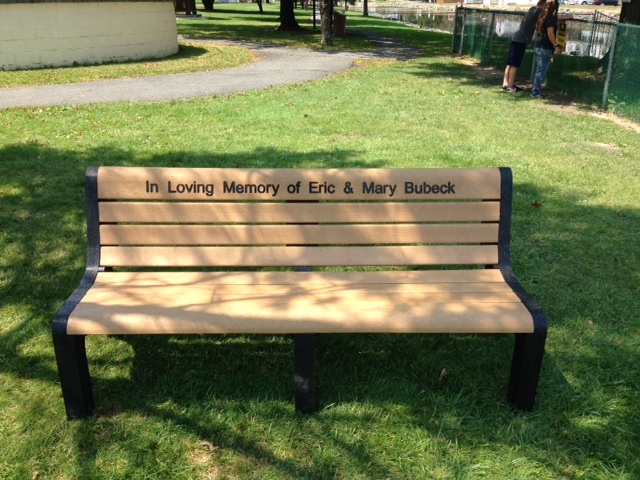 Remember a loved one or celebrate a joyous occasion with a park bench. Our six foot benches are made of recycled plastic. Please call for a price. Dedicate an ornamental or shade tree in honor of a special person or a special event. Call for Price and tree type. Schuylkill Haven Recreation Department and Schuylkill County Trout Unlimited are proud to partner together on a Lend A Rod Program in Schuylkill Haven. Schuylkill Haven Rec Department will administer the rods to children who are just learning to fish, can't afford a rod, or just want to give fishing a try. You can get a rod at the Recreation Office by coming with a parent or guardian and filling out a rental form. There is NO cost to rent the rod. The only thing that is asked is you use the rod respectfully and bring in the same shape you got it for another child to use. Schuylkill County Trout Unlimited will continue to support the Rec Department with rods and materials to supply as many children as needed. Schuylkill Haven has fishing opportunities at Bubeck Park in Stoyer's Dam and also at the Island Park complex in the Schuylkill River. So if you need a rod, give our office a call today!